This botanically-inspired pendant features a cast of Lapsana buds. The mold for this pendant was created from the stems and tiny yellow buds of Lapsana--a roadside beauty known for its healing properties. Jewelrymaker Kristin Schwartz then cast the form in .999 pure silver and added a blue-green patina to provide subtle, organic contrast. 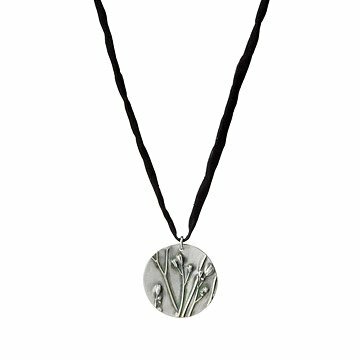 Suspended from a hand-painted black silk cord, this sweet, botanically-inspired piece serves as a gentle reminder of the calming, healing properties of nature's garden. Handmade in Seattle. Kristin Schwartz studied studio art in Southern California and 11 credits from a degree, she got scared and changed her major to business management. It all worked out for the best. Kristin spent most of her life in the corporate world. Although successful, she never felt completely comfortable in corporate skin. As an exit strategy, she began to lay the groundwork to start her own business, though Kristin had no idea what that would be. She was only sure it would be something creative. Kristin discovered Precious Metal Clay (PMC) through a 3 hour class and that was the beginning of the end of her corporate life. She has taken a couple workshops since then, but is primarily self taught. Kristin is influenced by everything natural but not limited to “nature”. Growth and change are naturally occurring in people as well as our environment. She hopes the results of her influences touch those that see her jewelry, even in the smallest way. She designs and creates each piece by hand from her studio in the Seattle area. Kristin's two boxers, Kisa and Lumen are always around to offer moral support. Kristin considers everything she makes a tiny piece of art. Wear your tiny piece of art with a happy heart because that is how it was made. Vist our blog to learn more about Design Challenge Winner Kristin Schwartz and her work! Avoid chlorine and silver polish.